Although it sounds mysterious all it really means is how many millimeters of gear are there per tooth. But it's millimeters of diameter not circumference that we're interested in here. So to calculate the modulus of a random pinion we need to carefully measure the diameter of the pinion across the middle, from half way up one tooth to half way up the tooth on the opposite side of the pinion. This distance is called the pitch diameter. 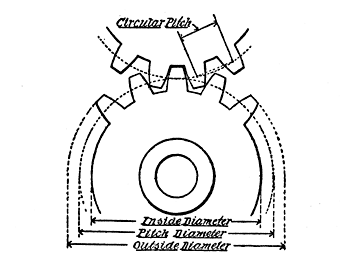 Pinions are sometimes labeled as "metric 48 pitch which is actually 0.6 module.